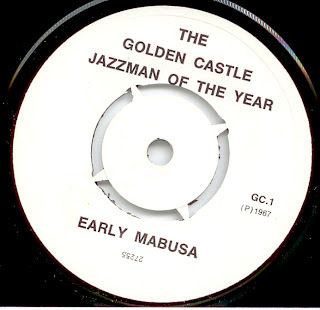 Our Winston Mankunku ‘Golden Castle Jazzking 1968’ post (here) set us off on the trail of a different Golden Castle related 45 – the promotional single from the previous year, when the ‘Jazzman of the Year’ award was handed to legendary drummer Early Mabuza. Paul Nugent, who kindly helped us with the Mankunku post, tipped us off to the existence of a copy in the Distell breweries archive, and thanks to his introduction and the kind cooperation of Distell we can present here recordings of the 1967 Jazzman of the Year single. 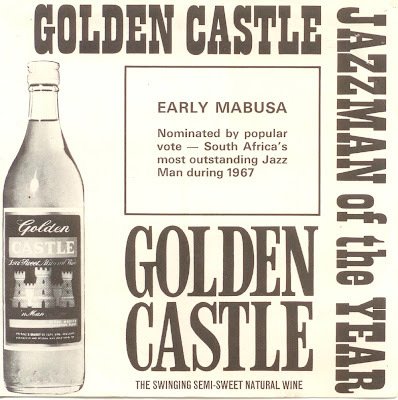 The beverage, and the upcoming end-of-year competition that Mankunku would win, were advertised with a photo of Mabuza throughout 1968 in Drum magazine (see the Mankunku post linked above for a scan of this ad). However, anyone who actually obtained a copy of the single expecting a brace of hard-swinging jazz sides from the drummer and bandleader who had triumphed at the 1964 Cold Castle Festival (when the award was shared with the Malombo Jazz Men) might have been a little disappointed. Instead of the modernist small group sounds that might rightfully have been expected, by far the majority of the single is taken up with jazz-style jingles for the drink, with vocals based on the slogan ‘You’re a King with a Golden Castle’. With three of these jingles per side, there isn’t much room for much else, and the revered and brilliant Mabuza himself is only represented by four short drum solos, which crack and tumble along with brio before stopping so the listener can be treated to a further rendition of ‘You’re a King…’. 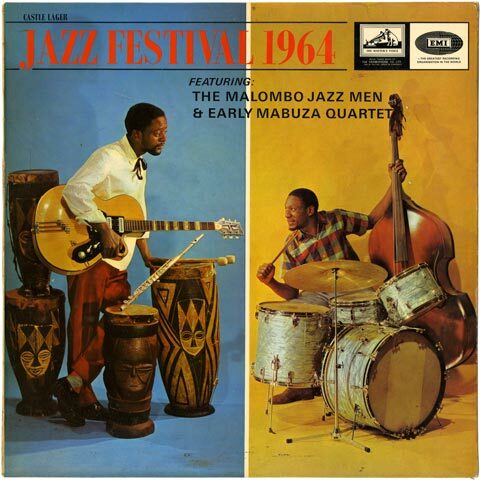 By 1967, Mabuza had long been held in the highest regard by the jazz community and public. 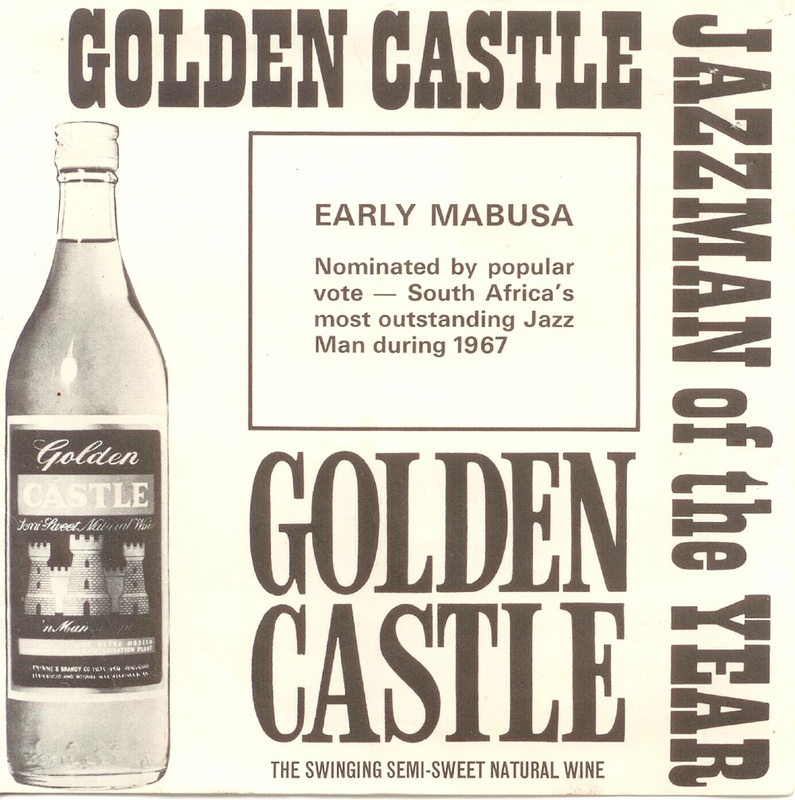 Even if the Castle Wine and Brandy Co., cashing in on the perennial link between alcohol and jazz, had honestly hoped to reflect this, a handful of 30-second solos generously padded by adverts for booze seems a mean coronation. We are proud to be able to present these recordings from the Distell archive, which holds the only known copy of the single. 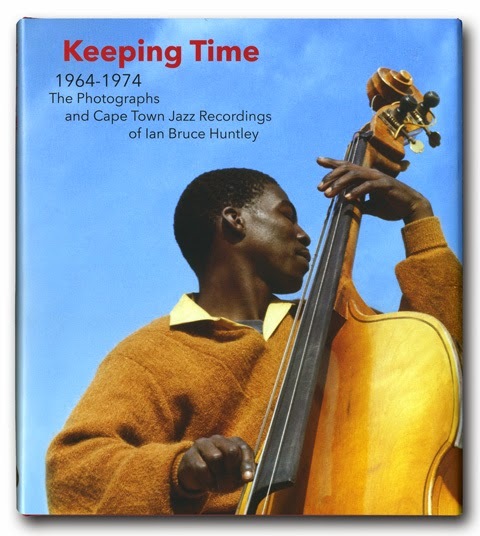 It would have been impossible to make this historical document public without the generous assistance and enthusiasm of Mareza at Distell, and the work and knowledge of Paul Nugent. You can visit the Distell website here. Many thanks from all of us at Electric Jive. Wonderful follow-up to the Nxumalo offering! thanks - I thought it would make a nice pendant post, and an interesting (and telling) comparison, given that the Nxumalo is also in Mabuza's honour. did not have more funky musos like the movers for sometime now, otherwise this is still good for its very rare , makes it interesting . Looking for 1983/4 Margaret Singana LP "isiphiwo sam"